AQUALABO is specialized in the design and manufacture of innovative technological solutions dedicated to water quality control. Aqualabo’s aim is to meet every demand from the simplest to the most elaborate. To do this, they have an engineering department that develops the water analysis laboratories, as well as the water control facilities. Based on their products and a few additions, they can rise to the challenge of the user requirements. 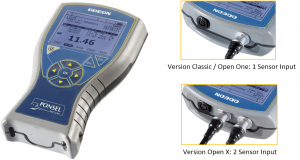 ODEON is the range of handheld numerical devices dedicated to water quality control on the field or in the laboratory. Real combination of ruggedness and digital intelligence, ODEON offers reliability and flexibility never reached before. With digital sensors DIGISENS, it can measure up to 7 physicochemical parameters (pH, ORP, Temperature, Oxygen, Conductivity, Salinity, Turbidity). ODEON is available in version OPEN ONE with 1 sensor input or version OPEN X with 2 sensor inputs.